X-ray imaging systems are used throughout the country by domestic and military law enforcement, corrections, and security agencies. These systems are used at international borders, in transportation venues, at government buildings, and other venues. 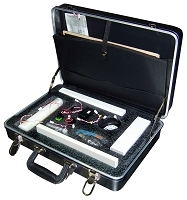 The x-ray systems are used to find concealed objects, including threats and contraband. The NIST Security Technologies Group (STG) led a recent effort to revise and update the foremost internationally-recognized and accepted imaging performance standard for checkpoint x-ray systems. 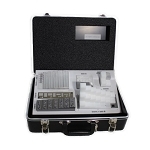 This documentary standard, known as ASTM F792, “Standard Practice for Evaluating the Imaging Performance of Security X-ray Systems,” is widely used throughout the world to measure the image quality and materials detection capabilities of such systems. The standard was developed in the 1980s and the STG-led 2017 revision was the first major revision for more than 15 years. The revised standard now incorporates three distinct test objects for different testing scenarios, which greatly improves the applicability and usefulness of the standard that previously relied on a single test object. 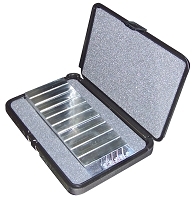 The F792-RT is a small test object used for routine testing (RT) of an x-ray system (e.g. daily testing to ensure the system is functioning properly). 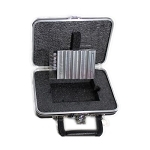 This test object is a modification of the F792-88 test object that had been withdrawn but was still being used by industry for field verification of the imaging performance of the cabinet x-ray systems. The F792-HP test object relies on human perception (HP) judgements of feature visibility to score its tests. This is essentially an upgrade of the previous F792-08 test object with some major improvements, particularly to the materials detection tests. The F792-OE test object is designed to be objectively evaluated (OE), that is, evaluated using computer algorithms. The design of this test object differs from that of the RT and HP, which must be evaluated by humans. The images of the F792-OE test object are evaluated by a set of standard image analysis algorithms that are defined in the standard. As such, differences in human subjectivity or perception do not affect scoring on the OE tests. 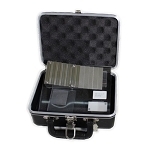 We are pleased to be able to offer these three Test Kits along with the ASTM F792-88 Security Step wedge and our exclusive CCSP Test Kit, all essential components of an effective X-ray Security Screening system.